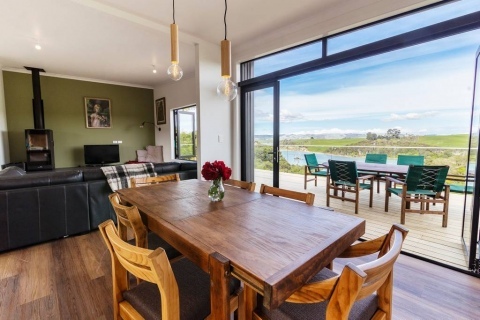 It was such a pleasure working with our clients, building this 3 Bedroom, 180m2 Design and Build overlooking Moonlight Bay on Greenslade Road, Raglan. 3 bedrooms, 2 bathrooms (1 bath tub) with Open Living / Dining / Kitchen and indoor fireplace! You can experience this stunning new build by booking your stay with Book a Bach.